Now you can MASTER yourself in the opening stage and also get BONUSES with HUGE DISCOUNT! - Leave your opponents way behind! 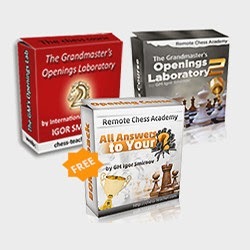 In addition to the course the “Bonus Pack” ($25), you will get the “The Grandmaster's Openings Laboratory” ($53) 2nd part of this course “GM’s Openings Laboratory – 2” ($98). + Leave your opponents way behind!